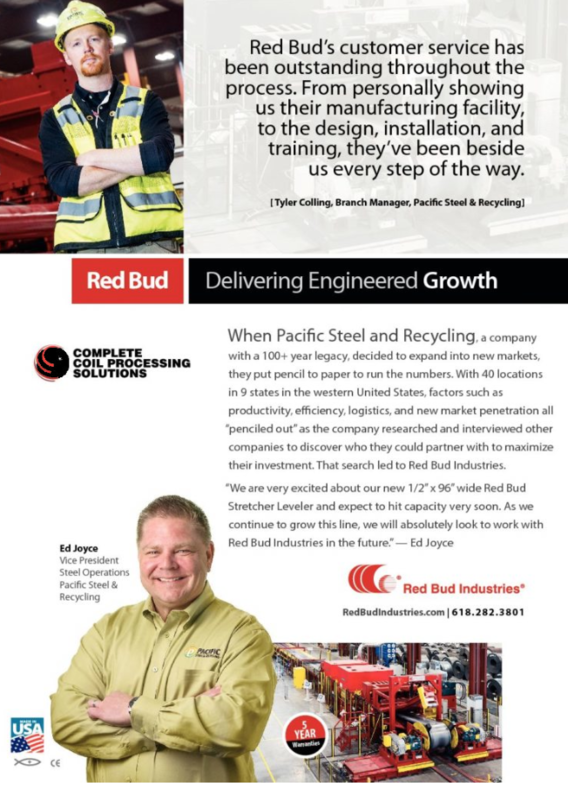 When Pacific Steel and Recycling, a company with a 100+ year legacy, decided to expand into new markets, they put pencil to paper to run the numbers. With 40 locations in 9 states in the western United States, factors such as productivity, efficiency, logistics, and new market penetration all “penciled out” as the company researched and interviewed other companies to discover who they could partner with to maximize their investment. That search led to Red Bud Industries. 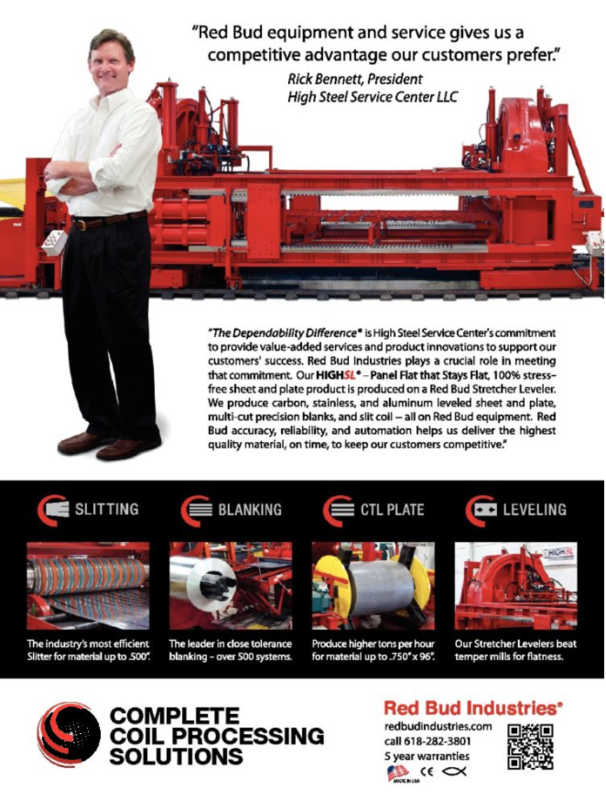 Our Red Bud Industries’ Stretcher Leveler is so much more than an important piece of equipment– it has transformed our business. 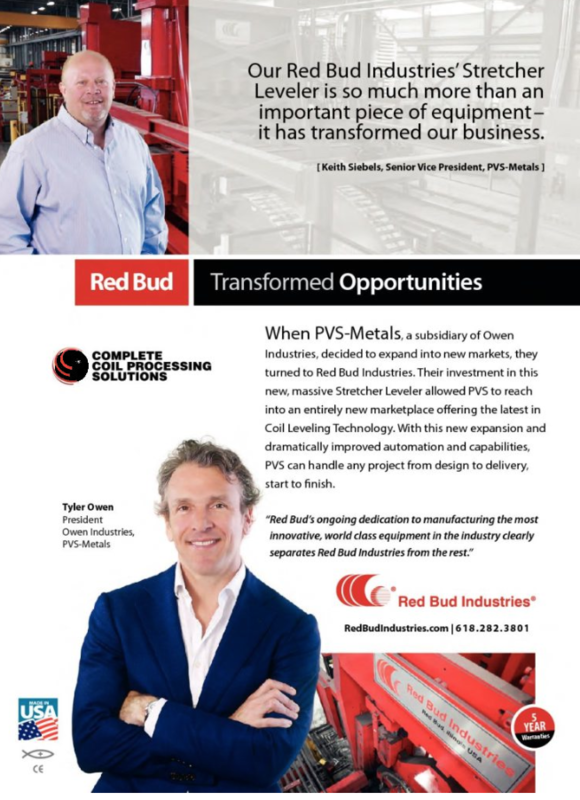 When PVS-Metals, a subsidiary of Owen Industries, decided to expand into new markets, they turned to Red Bud Industries. 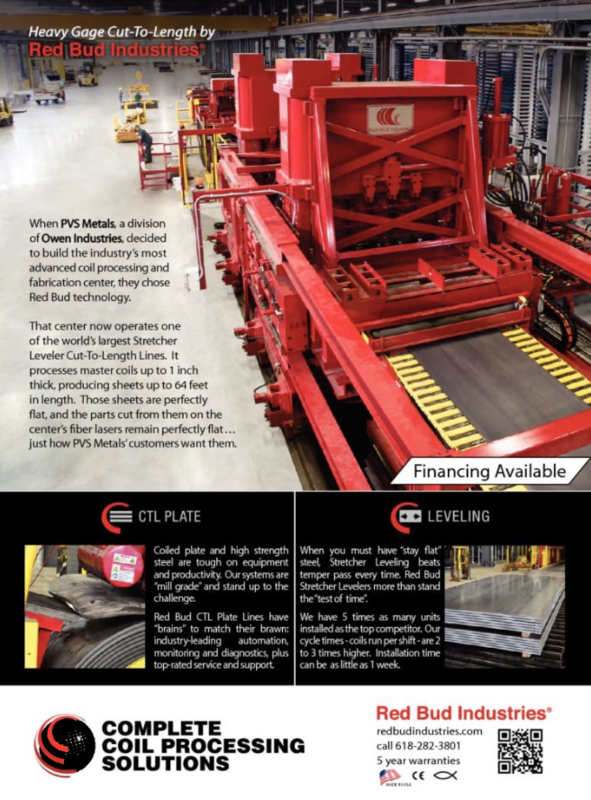 Their investment in this new, massive Stretcher Leveler allowed PVS to reach into an entirely new marketplace offering the latest in Coil Leveling Technology. With this new expansion and dramatically improved automation and capabilities, PVS can handle any project from design to delivery, start to finish. Red Bud’s ongoing dedication to manufacturing the most innovative, world class equipment in the industry clearly separates Red Bud Industries from the rest. 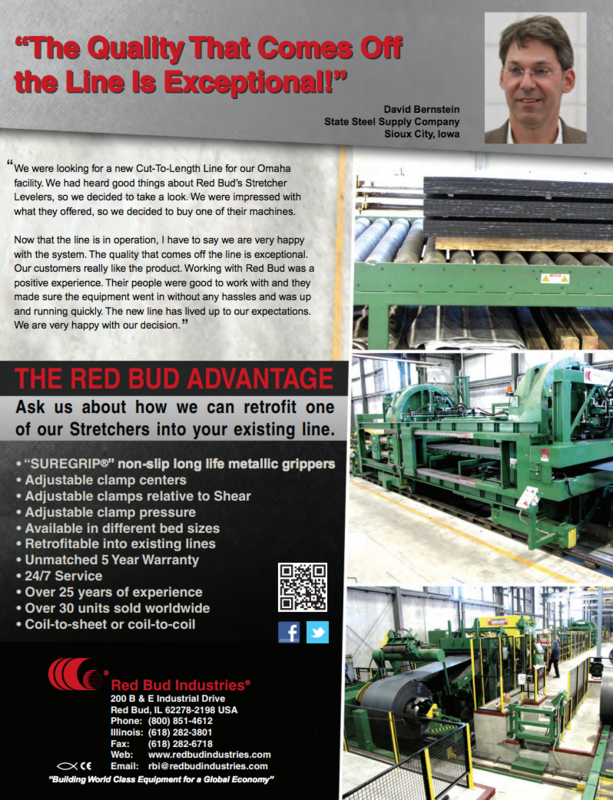 When PVS Metals, a division of Owen Industries, decided to build the industry’s most advanced coil processing and fabrication center, they chose Red Bud technology. That center now operates one of the world’s largest Stretcher Leveler Cut-To-Length Lines. It processes master coils up to 1 inch thick, producing sheets up to 64 feet in length. Those sheets are perfectly flat, and the parts cut from them on the center’s fiber lasers remain perfectly flat… just how PVS Metals’ customers want them. Customers choose us because our product is predictable, reliable, and repeatable. Same reasons we choose Red Bud. We sell high quality cut sheet and plate our customers count on to stay at after lasering, forming, or whatever they do with it. Red Bud has the best technology for that, but execution really sets them apart. 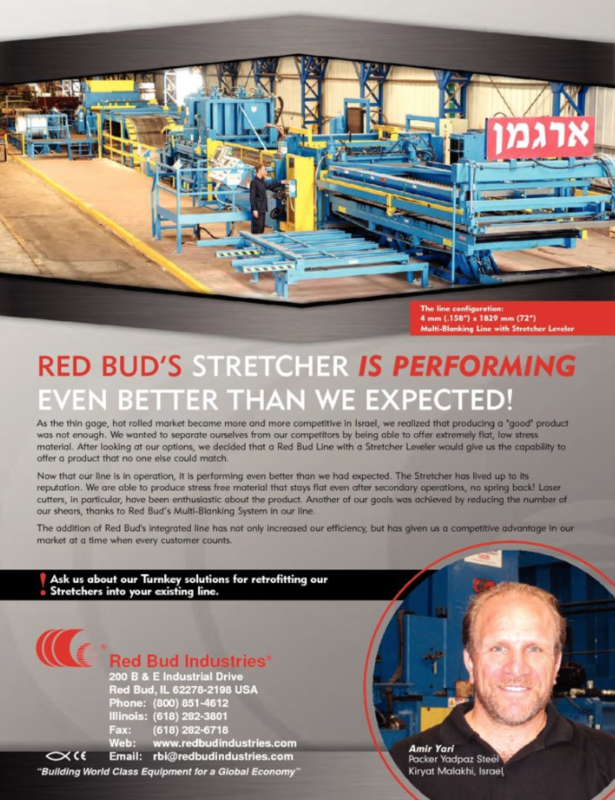 We operate two Red Bud Stretcher Leveler CTL Lines at our original facility, and decided to build a greenfield service center based around this advanced .500” Stretcher Leveler CTL Plate Line. We cut coil the same day we opened, and within just a few weeks, we were running 12 hours a day, 7 days a week, thanks to predictable, reliable, repeatable Red Bud support. Red Bud’s technology gave us a clear competitive advantage. Their service helps us maintain it. 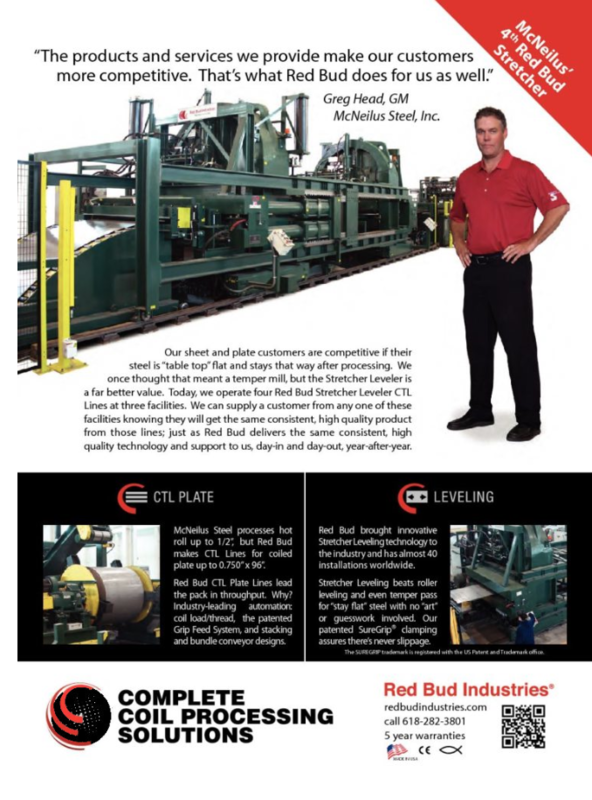 At McNeilus Steel, we succeed by adapting to our customers needs. 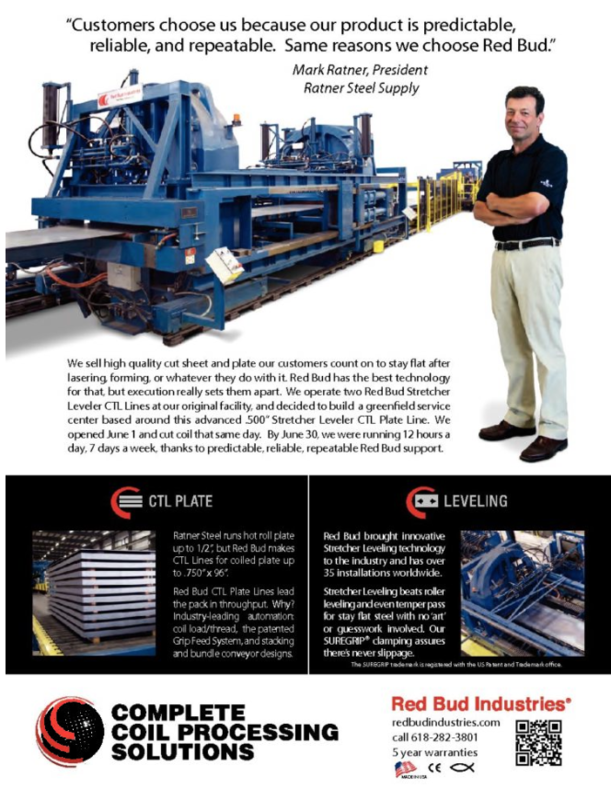 They needed ‘stay flat’ steel blanks, so we invested in a Red Bud Blanking Line with Stretcher Leveling. Our customers were delighted with the product, but also wanted it in heavier gage. 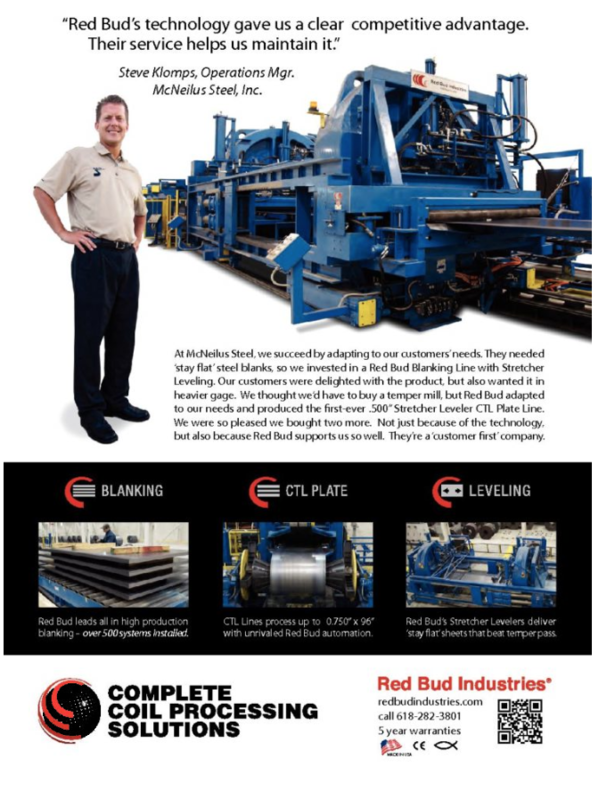 We thought we‘d have to buy a temper mill, but Red Bud adapted to our needs and produced the first-ever .500” Stretcher Leveler CTL Plate Line. We were so pleased we bought two more. Not just because of the technology, but also because Red Bud supports us so well. They’re a customer first company. “We wanted to buy a Stretcher in order to improve our market share and differentiate our products from the rest of the market. We knew it would allow us to achieve unsurpassed flatness and eliminate spring back. After looking at a number of different manufacturers, we decided to go with Red Bud. They already had a lot of experience with stretcher leveling and had a proven track record. In a multi-year market research study, we determined that our industry’s top concern is the flatness of sheet and plate steel. Meeting this need for panel-flat, stress-free material required investment. In evaluating new equipment, we determined that stretcher leveling technology has evolved to become the price of admission to the marketplace. 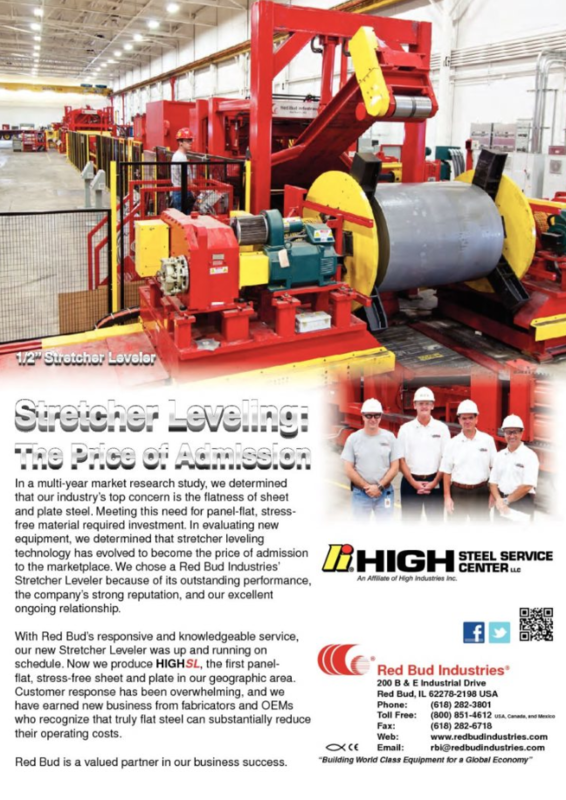 We chose a Red Bud Industries’ Stretcher Leveler because of its outstanding performance, the company’s strong reputation, and our excellent ongoing relationship. With Red Bud’s responsive and knowledgeable service, our new Stretcher Leveler was up and running on schedule. Now we produce HIGHSL, the first panel­flat, stress-free sheet and plate in our geographic area. Customer response has been overwhelming, and we have earned new business from fabricators and OEMs who recognize that truly flat steel can substantially reduce their operating costs. 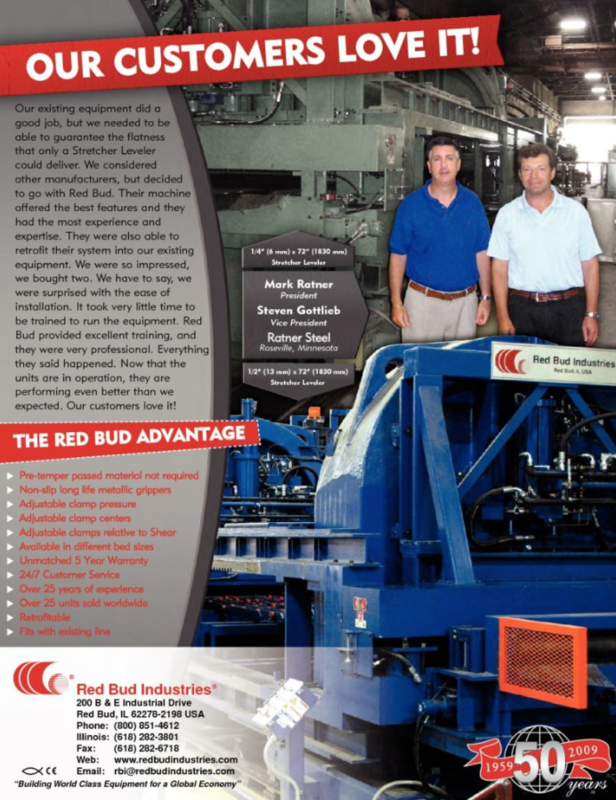 Red Bud is a valued partner in our business success. RICH MERLO, JDM STEEL SERVICE INC.
“The new line really gives us an edge, our customers love the product! 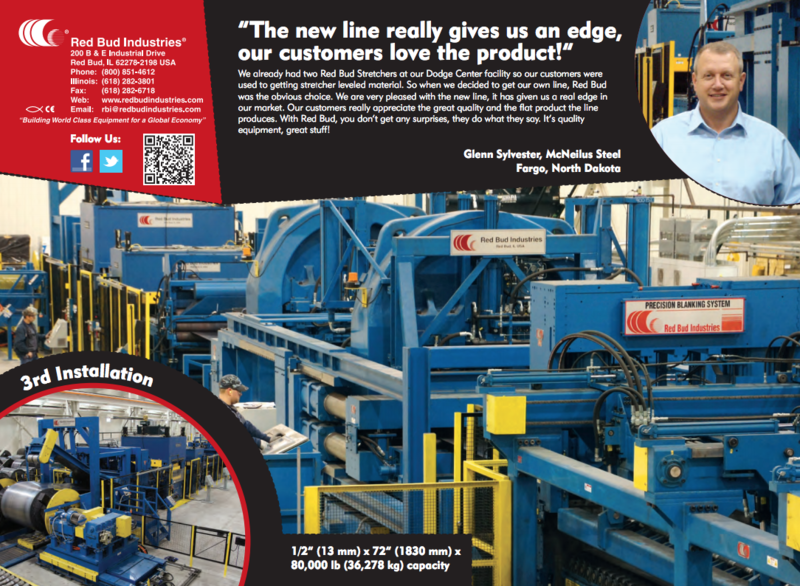 “We were looking for a new Cut-To-Length Line for our Omaha facility. We had heard good things about Red Bud’s Stretcher Levelers, so we decided to take a look. We were impressed with what they offered, so we decided to buy one of their machines. “As the thin gage, hot rolled market became more and more competitive in Israel, we realized that producing a “good” product was not enough. We wanted to separate ourselves from our competitors by being able to offer extremely flat, low stress material. After looking at our options, we decided that a Red Bud Line with a Stretcher Leveler would give us the capability to offer a product that no one else could match. Now that our line is in operation, it is performing even better than we had expected. The Stretcher has lived up to its reputation. We are able to produce stress free material that stays flat even after secondary operations, no spring back! Laser cutters, in particular, have been enthusiastic about the product. Another of our goals was achieved by reducing the number of our shears, thanks to Red Bud’s Multi-Blanking System in our line. 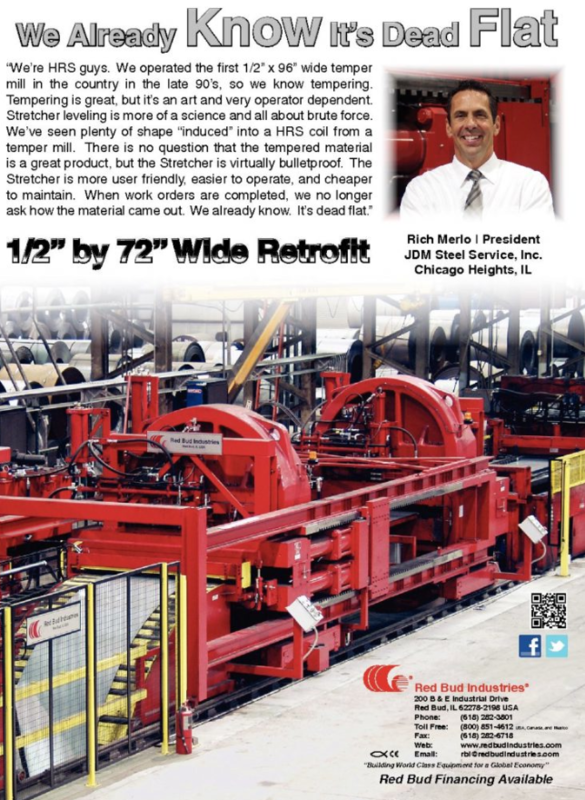 “We are very impressed by the Stretcher Leveler. 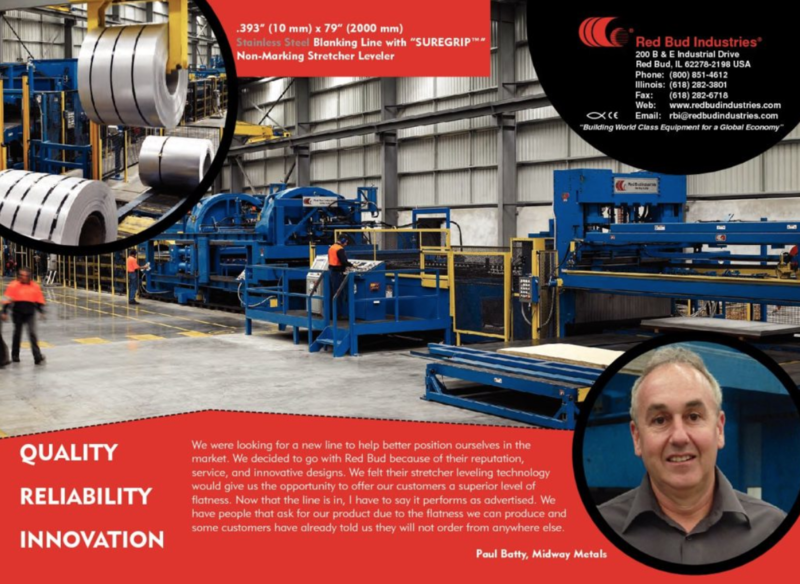 We wanted a line that could process high strength material, and guarantee an exceptionally flat product. We also wanted a system that would guarantee our customers better tolerances. After reviewing a number of manufacturers, we selected Red Bud Industries. 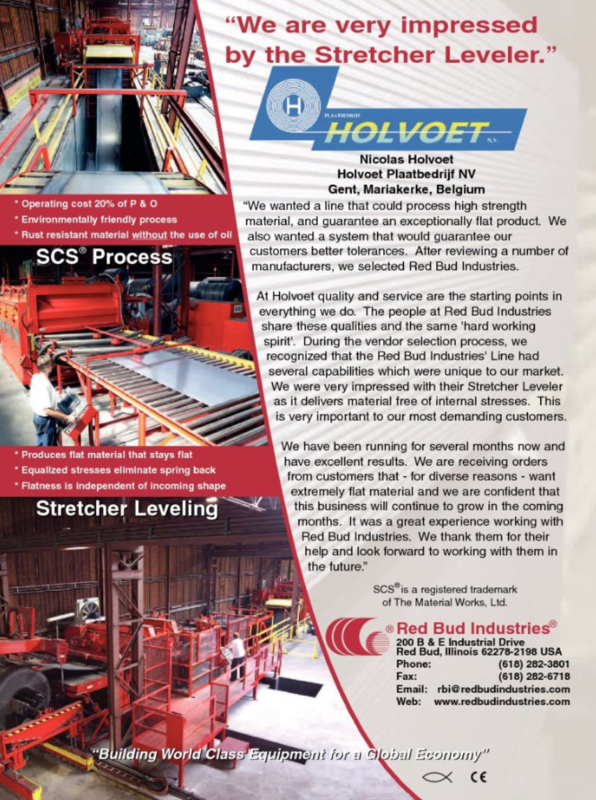 At Holvoet quality and service are the starting points in everything we do. The people at Red Bud Industries share these qualities and the same ‘hard working spirit’. During the vendor selection process, we recognized that the Red Bud Industries’ Line had several capabilities which were unique to our market. 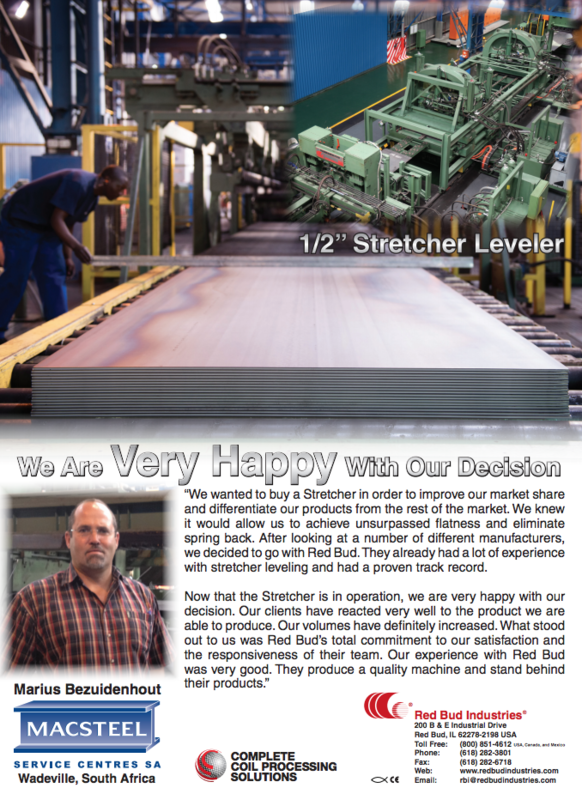 We were very impressed with their Stretcher Leveler as it delivers material free of internal stresses. This is very important to our most demanding customers.